The creation science movement has lost a stalwart champion. Dr. Duane Gish, longtime defender of creation truth, went home to be with his Savior on March 6, 2013. 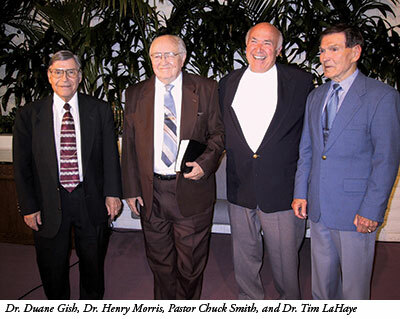 A memorial service was held for Dr. Gish on April 6 at Shadow Mountain Community Church in El Cajon, California. Over the course of a very full life, Dr. Gish traveled hundreds of thousands of miles and impacted countless people as he debated the evolutionists of his day and spoke in churches, schools, and elsewhere, sharing the scientific evidence supporting the accuracy and authority of God’s Word. For many, Dr. Gish’s talks were their first introduction to the fact that the Bible can be trusted in all matters—in science as well as theology. Many of today’s creation scientists can trace the beginnings of their work back to his ministry and influence. Born in Kansas and educated at University of California, Los Angeles, Dr. Gish received his Ph.D. at UC Berkeley. Soon after the 1961 publication of The Genesis Flood, he joined with other creation-minded scientists to found the Creation Research Society in 1963 and served on their governing board until 1997. 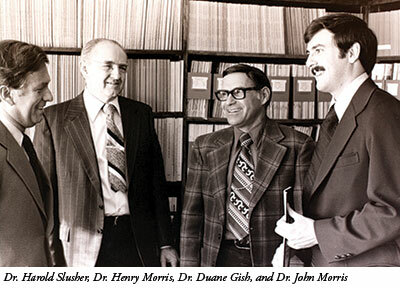 After a fruitful career in biochemistry at the Upjohn Company in Michigan, Dr. Gish joined Dr. Henry Morris at the newly formed Institute for Creation Research in 1970. At the time, there were no such ministries and no clear path to follow. Dr. Gish shouldered the daunting burden of speaking to any audience about the evidence for creation. He especially found his own ministry niche on the college campus, where evolution was thoroughly entrenched. His expertise equipped him to speak on origin of life topics in presentations that were enriched by his personal laboratory experiences. He had worked and published with recognized experts in the field, and his voluminous knowledge of the subject served him well. In those early days, evolutionists were caught somewhat by surprise when a qualified speaker—complete with a working knowledge of the relevant literature and research—challenged their worldview. Soon the lectures turned into debate opportunities, and Dr. Gish rose to the occasion. Over the years, he participated in over 300 formal debates, and by all accounts he won them all. Soon spokespersons for evolution publicly recommended that evolutionists not debate Duane Gish, because they would surely lose. He never enjoyed the confrontations, but he relished the chance to present creation’s evidences. The debates and campus lectures were always billed as a scientific—not religious— comparison of the evidence for and against evolution. His opponents many times tried to discredit him as a scientist by branding him as a Bible-believer. He never denied his Christianity, but scrupulously stuck to the scientific evidence, never bringing up the Bible. In the process of presenting truth unapologetically, however, he gave a good testimony. Josh McDowell claimed ICR’s work was “the cutting edge of evangelism.” Christian campus groups reported a great harvest of souls following the debates. Dr. Gish’s lectures most often began with an explanation of the nature of science and how any discussion of origins involved speculation about the unobserved past. He would then present a study of the record of life in the past as seen in the fossil record. He concluded with the laws of science, saying they precluded any self-transformation of organisms from simple to more complex forms. Depending on the time and interest, Dr. Gish would follow the lecture with sections on origin of life experiments or dinosaurs. He particularly shone during question and answer sessions because his encyclopedic knowledge and winsome way often won over the most aloof audience and sometimes even disarmed his most avid opponents. The subject of fossils proved his most valuable anti-evolution subject, and before long his debate lecture developed into a book, Evolution? The Fossils Say NO! Years later, after many printings, the book was updated and reissued as Evolution? The Fossils Still Say NO! This was a strong foundation on which the rest of creation thinking was built. He also authored other books, including A Creation Scientist Answers His Critics, Evidence Against Evolution, Dinosaurs: Those Terrible Lizards, and Dinosaurs by Design. Even though evolutionists frequently mocked him openly, censured him, and tried to silence him, Dr. Gish always comported himself as a Christian gentleman. Sprinkling in good humor, he had a habit of winning the hearts of those in the audience. His arguments were logical, his documentation relevant, and his case more believable than that of his opponents, but it was perhaps his personal presentation that carried the day. In short, the audiences liked him. Through it all, creationism grew into a movement that has impact to this day. The entire creation ministry—especially his ICR family—will miss Dr. Gish. He leaves a wife, Lolly, four children by his deceased first wife (also named Lolly), nine grandchildren, three great-grandchildren, and hundreds of thousands of intellectual “children” who are advocates of biblical and scientific creation. He was not a large man, but stood as a giant in defense of scriptural authority. “Well done, thou good and faithful servant” (Matthew 25:21). It is often difficult for we who remain behind to adequately acknowledge the impact a person’s life has had on us. Those of us who knew Dr. Gish could relate many personal stories and, quite probably, tell some of his jokes that made us all laugh. He was a delight to know. Most readers of Acts & Facts are acquainted with Dr. Gish’s professional reputation. His long career with ICR left a trail of defeated debate opponents, as well as articles and books that have taught and encouraged many. He will be missed. But perhaps some insight from inside the Morris family might be appropriate. From their earliest association, Drs. Morris and Gish became friends. It seemed unusual to the family. Duane was feisty, boisterous, and a flurry of energy. Dad was quiet, unassuming, and content to be in the background. Yet the two of them clicked in a wonderful way, challenging and stimulating each other as perhaps no other combination could have done. God surely put the two of them together. Mary Louise (Dad’s loving wife) and Lolly Gish were active together in Christian Heritage College and, of course, in ICR. Their friendship grew deep and they shared many hours of prayer for their husbands and the ministry. When Lolly became ill, Duane became her caregiver with a tenderness that showed a side to him that was not visible to many of us. Much can be learned about a man’s character by the way he treats his wife. Later, when the “first Lolly” went home to be with the Lord, Duane married the “second Lolly”—the beautiful and gracious widow of Richard Bliss, another ICR scientist. Dr. Bliss and his wife had been close friends with the Gishes. Once again, the Lord seemed to have been setting the stage behind the scenes for a continuation of mission and ministry. One final and personal note: When the ICR board asked me to assume the role of CEO, Dr. Gish frequently called to encourage and assure me that “things” were all right and would prosper in the years ahead. Thanks, Duane, for your leadership, friendship, and life well-lived. Cite this article: 2013. Duane Gish: Celebrating a Creation Champion. Acts & Facts. 42 (5): 18-19.